Enjoying a strategic location in the city center’s main square, the Nautilus hotel operates in a renovated historical building and provides luxury accommodation in Tabor - Czech Republic. The hotel opened its doors to visitors in March 2006; it caters to a wide range of traveler types, including businesspeople, holidaymakers, and romantic couples. Featuring many modern amenities and an elegant and exclusive atmosphere, this 4 star Czech hotel will surely offer you a memorable stay. 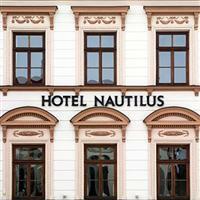 The Nautilus hotel is one of the best Tabor hotels, having a high quality service and easy access to the historical and cultural landmarks of the southern Bohemia region. The hotel is an excellent base for exploring everything that the area has to offer, such as the tranquil and idyllic countryside with its beautiful nature and tucked away traditional Czech villages. The on-site elegant Goldie restaurant overlooking Zizka Square and the intimate wine bar will add to the memorable stay that you will enjoy at the Nautilus hotel, offering mouthwatering Czech and international specialties, and a wide range of wines and other drinks respectively. For successful business events or sophisticated weddings, this Tabor hotel offers a state-of-the-art meeting room. Throughout the hotel you can admire many original works of art, sculptures, and restored antique furniture – this Czech hotel is a genuine and unique gem, which a distinct charm and a special ambience that invites you to relax and unwind. Tabor and its surroundings offer a wealth of recreation possibilities, such as hiking on the many color-coded trails with varied difficulty levels, biking, and playing golf at one of the seven courses nearby. For a cultural touch to your holiday in Tabor, you may enjoy a visit to the Museum of Photography Sechtl and Vosecek, or the Gallery 140, which displays a permanent exhibition of portraits from the 19th and 20th centuries. Moreover, a pleasant 90 minute drive from the Nautilus hotel will take you to the capital city of Prague – one of Europe’s most vibrant cities, and to Cesky Krumlov.